When it comes to anti-aging treatment, Botox is typically the first step that people take towards facial rejuvenation. That’s because it’s non-invasive, economical, and one of the most efficient methods of reducing wrinkles and unwanted facial lines. These lines, whether they be from excessive laughter, frowning, squinting or just natural aging, are no reason to stop looking your best and most vibrant self. That’s why here at Dr. Konstantin’s New York office, Botox treatment is administered with special attention to each patient’s needs so they can continue living their best life just as they did before those bothersome lines. If you’ve ever looked in the mirror and thought, “yep, those are ‘crows feet’,” then Botox may be the anti-aging treatment for you. Are you an avid reader, always reaching for your spectacles in fear of straining your eyes to see the morning paper or your email notifications? Perhaps you love to laugh, and laugh lines are just something you’ve accepted over the years. Maybe your profession or just today’s news has you in a constantly pensive state, and the only time your face gets to relax is that brief hour between waking from your stressful dreams and getting ready for your equally demanding day. Well, we sure hope that last one doesn’t describe you, but if it does, then we believe Botox injections may restore, at the very least, your ability to look and feel rejuvenated with natural looking results. 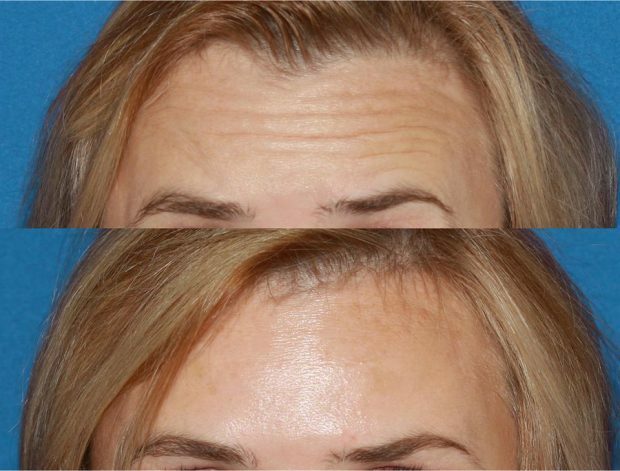 As with many other medical treatments, addressing the issue – in this case, the formation of facial lines – is much easier to do at an early stage than it is to try and smooth out lines that have become deep over time. Since most people begin to develop noticeable lines after their 20’s, it’s those in their 30’s and 40’s who would experience the most visible benefits of Botox treatment. The process for injections is relatively simple, as they’re used to smooth out the wrinkles caused by repetitive activity of the facial muscles. Botox (Botulinum Toxin Type A) is injected into the muscle in order to block the transmission of nerve signals which then causes the muscle to relax. This reduces the mechanical stress placed on the overlying skin, which in turn allows the overlying skin to regenerate and repair the damage, i.e. smoothing out the wrinkles. The result is a younger and natural looking face usually within 3-7 days of your first appointment. Dr. Konstantin takes personal care of each and every Botox treatment administered here at his New York City practice. Treatment usually starts with the application of a numbing agent to minimize the discomfort of the injections. Once the skin is sufficiently anesthetized, the doctor assesses facial mobility by asking the patient to raise their eyebrows, frown, and squint. After using this assessment to determine the best treatment strategy for the individual patient, the doctor injects a small amount of Botox into the muscles responsible for facial expression. It might take about 15-20 small injections to achieve the desired effect, but the needle is typically very small, so most people tolerate this rather well. A reasonably small inconvenience to bear for something with such quick and long lasting results. After the injections, a cooling pack (not ice) will be applied to the skin to minimize the possibility of bruises and swells. Beyond that, there’s really no special care or lifestyle modifications required before you can get right back to your life. We do, however, advise avoiding blood thinning medications such as aspirin or Motrin on the day of treatment. If you can adhere to that, then muscle movement will diminish and wrinkles will begin to fade, giving you the desired, visible effects typically within a week. A single treatment usually lasts for about 3-4 months, but we recommend having your face retouched every 6 weeks or so to reap the full benefits. If you want to receive Botox Cosmetic injections in advance of a high profile event or social gathering, we recommend scheduling an appointment at least 1-2 months before your desired engagement. This provides sufficient time for the facial lines to smooth out and also allows for small adjustments or additional injections should they be necessary. The cost of Botox might range from $300 to $1,000 depending on the amount of injections administered, but prices tend to increase when administered by an experienced injector or board certified facial plastic surgeon such as Dr. Konstantin. That being said, the price tag here is still considerably lower than any surgical treatment for facial rejuvenation. And with the scientific expertise of facial anatomy held by Dr. Konstantin, you can enter and leave our New York office in no time at all having experienced the acute attention to detail and modern techniques employed on each individual who walks through our doors. Still curious? Come on in and see for yourself, schedule a consultation and see what Botox can do for you.